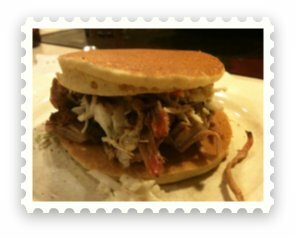 You may think this is weird at first glance, but a good corn bread recipe for pancakes makes an awesome addition to pulled pork barbecue sandwiches as a substitute to boring white buns. In fact, this is my wife's favorite way of eating a pulled pork sandwich. But, to bring it to the level of total culinary perfection, you have to dress the sandwich with a coleslaw, preferably a sweet vinegar based coleslaw. That reminds me. I need to do a video on coleslaw. This corn bread recipe pancake would also work beautifully with a pork loin sandwich. If you want to know the best way to prepare pulled pork or pork loin, click on the "pork" button on the navigation bar to your left. The video below is very short but shows you how to prepare these pancake buns. I would suggest watching it. Mix all dry ingredients in a large bowl. Then, add the wet ingredients and mix until all lumps are gone. Use a 1/8 cup measuring cup and spoon the batter onto a skillet at medium to medium-high heat. When the bubbling starts, flip the corn cake. Cook for another two minutes and take of the skillet when golden brown. These can be made in advance and can be frozen as well. Please view my video below. If you have any questions for Dave on this recipe, Click Here.